Apeejay Tea presented 90 of its pluckers from 17 tea estates across Assam with the Best Pluckers’ Award for exemplary service and plucking skills displayed in April and May this year. “The Champion of the Season, annual awards will be decided after the finalizing of the last Best Plucker Award in December and Champion Pluckers will be identified for each cluster and felicitated in a special ceremony along with their families in the cold season. All awards are cash rewards accompanied by a certificate for Best Pluckers and a trophy for Champions of the Season,” said Ghosh. 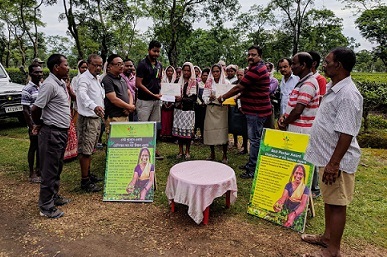 “The best plucker award given to the performers in Field will encourage other pluckers to work sincerely,” said Sahachari Udeshwar, the winner from Kherbari Division of Apeejay Tea’s Khobong Tea Estate in Tinsukia on receiving the award. Wife of a retired Khobong employee, Sahachari has nearly two decades of experience in plucking and is the fourth generation in her family who is working in Khobong tea estate. Mother of four, her eldest child, 31 year old Heina, works alongside her in Khobong gardens, another is pursuing graduation and the youngest is in Class 10, stated a press communiqué. 21,000 pluckers, almost all of them remarkable women, participated in the awards process that generated excitement and a focus on quality. 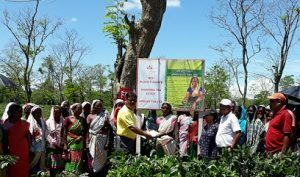 “My Challan Sirdar and Mohurer always motivate me and I am very inspired by this new initiative by our company,” said Kajal Tanti, winner of the Diglibari division of Apeejay Tea’s Kharjan Tea Estate in Dibrugarh. A mother of three, one of whom is specially-abled child, Kajal lost her husband, sub-staff dresser in the Kharjan Hospital and this single mother has bravely led from the front, is educating her sons in schools at the estate and also giving her best at work. Kajal came to Kharjan as a bride and has given 16 years of service to the estate. Durgamoni Orang won Best Pluckers Award for Sessa Division of Sessa Tea Estatein Dibrugarh. The loss of her husband in a wild elephant attack in 2011 brought her to work and she has been able to win kudos all round for her skills. Bobita Robin, winner of the No 12 Side division of Apeejay Tea’s Budlabeta Tea Estate is the granddaughter of the Budlabeta’s trusted Line Chowkidar who was widely regarded for his dedication and vigor. Salmi Guriya, winner of Dhulapadung division, originally hails from South Bihar, now Jharkhand, Salmi and her family have been staying in Dhulapadung TE for four generations now, all of whom have worked for the estate including her father who used to be Line Chowkidar and her mother, who used to be a plucker, both retired in 2014 and 2015 respectively. The Apeejay Tea Best Plucker Award identifies a winner every 60 days in both Permanent and Casual categories, in a total of 45 divisions across Apeejay Tea’s Budlapara, Khobong, Talup, Pengaree, Budlabeta, Hokonguri, Kharjan, Hilika, Hapjan, Napuk, Suffry, Jaboka, Muttrapore, Dhulapadung, Borjuli, Sessa and Ghoirallie tea estates located in Tinsukia, Dibrugarh, Charaideo, Udalguri and Sonitpur districts of Assam.